Get help with Beyond Pricing - What are last minute discounts? All Categories ​>​ Customizing Prices ​>​ What are last minute discounts? What are last minute discounts? Beyond Pricing allows you to set percentage last minute discounts in order to increase the likelihood that you receive a booking in the immediate short term. Last minute discounts will pull the nightly price down but never below your minimum price. By default Beyond Pricing inputs a discount of 25% for reservations booked within the last three days to stay and 10% for the last seven days to stay. Capturing bookings within the last week is very difficult as most people plan in advance. For this reason, we recommend being more aggressive within the last 7 days. Studio and one bedroom units tend to book last minute more often, while larger rentals book further in advance. We recommend setting more aggressive discounts for larger homes. Fly-to markets may want to push their last minute discounts into the last 21 & 28 days. We recommend staggering discounts with the highest discount at three days and so forth. In order to adjust your last minute discounts, go to the customize tab and click on the last minute discounts link. You will have the option to select an increase or decrease and whether or not it should apply "for the next" x amount of days or to begin "after" x amount of days. Then input whatever percentage discount you feel appropriate and hit the green save button at the top of the screen. Note: You will need to have at least one Last Minute Discount saved. When you go back to your calendar the pricing breakdown will show that the "Vacancy is less than 3 days away". In the image below the current date is April 9th. 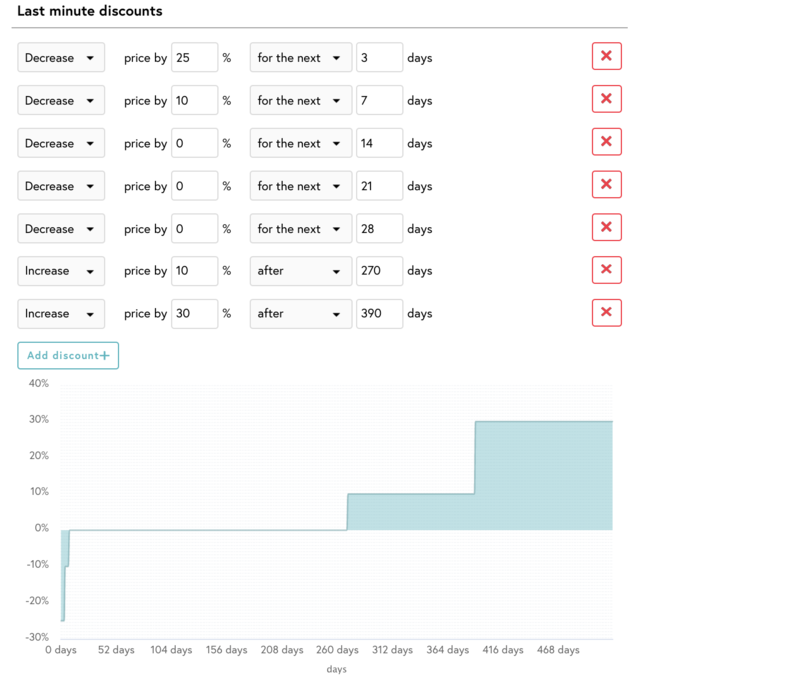 How do I set up weekly or monthly discounts with Beyond Pricing? How can I view my dashboard as a list? What is my Minimum Price and how do I know if it&apos;s right?